This article is about the minor league baseball league. For other uses, see International League (disambiguation). Not to be confused with Inter-National League. The International League (IL) is a Minor League Baseball league that operates in the eastern United States and is headquartered in Dublin, Ohio. Like the Pacific Coast League and the Mexican League, it plays at the Triple-A level, which is one step below Major League Baseball. It was so named because it had teams in both the United States and Canada (and for several years in the 1950s in Cuba as well). 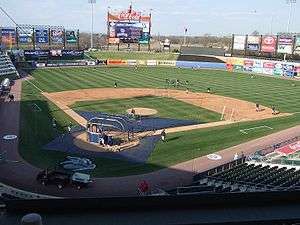 However, since the relocation of the Ottawa Lynx to Allentown, Pennsylvania, to become the Lehigh Valley IronPigs for the 2008 season, all of the league's teams are now based in the U.S. The International League was created from the mergers of member teams from three precursor leagues: the Eastern League, founded in 1884; the New York State League, formed in 1885; and the Ontario League, also organized in 1885. 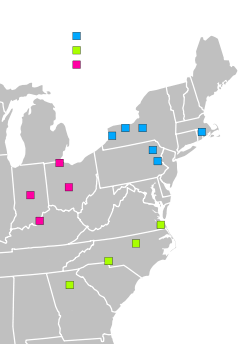 The New York State and Ontario leagues merged in 1886 to form the International League, and in 1887 the Eastern League was absorbed to create a 10-club league. The league collapsed soon afterwards, when the Northern teams claimed that it was too onerous to travel to the South and formed the International Association. Teams and league names came and went over the years. The League was also affected by the effort to establish the Federal League as a new third major league in 1914-1915, with franchises being added and dropped and new stadiums/ball parks built. In 1954, a franchise was awarded to Havana, Cuba, but due to political upheaval in that country it had to be moved — to Jersey City, New Jersey — in the middle of the 1960 season. Another foray into the Caribbean failed when the newly created team in San Juan, Puerto Rico, added in 1961, had to be moved to Charleston, West Virginia, in mid-season. In 1971, an International League all-star team beat the New York Yankees in an exhibition game in Rochester, New York, before 11,000 people. In 1984, the all-stars lost to the Cleveland Indians in 11 innings before 11,032 fans in Columbus, Ohio, to commemorate the league's 100th anniversary. The International League and the American Association, another Triple-A league that operated in the Midwest, voted in 1988 to play inter-league games. The league also split into two divisions that year. The inter-league concept ended in 1992, but the two league divisions remained. In further inter-league play, in 1988, the three Triple-A leagues, the other being the Pacific Coast League, met to play the first Triple-A All-Star Game. One team was made up of All-Stars from American League affiliates and the other of National League affiliates. Beginning in 1998, a team of IL All-Stars faced off against a team of PCL All-Stars. This game was the first of its kind. It was played in the Buffalo Bisons' new stadium, Pilot Field (now known as Coca-Cola Field). Also in 1998, with the addition of three new teams from the disbanded American Association and the Durham Bulls who previously played in the Carolina League, the International League reorganized into three divisions: the North Division, South Division, and West Division. At the end of each season, the three divisional leaders and a wild card team square off in best-of-5 playoffs, with the winning team of the finals awarded the Governors' Cup, the league's championship trophy. Since 2006, the league champion has met to play the PCL champion in the Triple-A Baseball National Championship Game, a single Triple-A Championship game. Previous class championship series included the Junior World Series and the Triple-A World Series. In 1933, the International League introduced a new playoff system, awarding the winner the Governors' Cup. This has become the recognized International League champion. Italics indicate team is now defunct. Wikimedia Commons has media related to International League.